Our Expert for Sleep Apnea in Lunenburg, MA, Asks – Do You or a Loved One Snore? Restore Your Quality of Life with the Success of Airway Orthodontics! 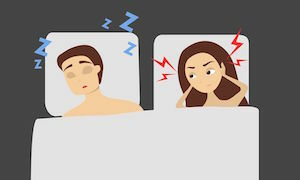 Do you suspect you have a snoring problem or spend half the night trying to ignore the loud snoring of your partner? Our expert for sleep apnea in Lunenburg, MA, says snoring is not simply an annoyance that keeps others from getting quality sleep but can be a sign of a more serious health problem called sleep apnea. Sleep apnea is characterized by pauses in breathing that significantly obstruct your airflow, often occurring in people with chronic snoring. In fact, according to our airway orthodontic specialist, medical research has found the chronic oxygen deprivation caused by this condition raises your risks for high blood pressure, heart disease, stroke, metabolic disorders, and diabetes. The research also uncovered the sobering fact that 80% of people with moderate to severe obstructive sleep apnea aren’t even aware that they have this condition! Don’t Let This Be You! Walker Orthodontics Can Help! Our groundbreaking approach to orthodontic care for both children and adults, Airway Orthodontics, is a relatively new medical subfield that studies the established link between optimal breathing and long-term health benefits. Keep reading to learn how you can find out if your snoring is a more serious problem and not simply an annoyance! Many people are not even aware that they snore. Recognizing your snoring patterns can help determine if your snoring is a sign of a more serious problem. Ask your partner if you gasp or choke during sleep, or study your own sleep patterns by using an app on your smartphone, suggests our knowledgeable orthodontist. Apps like SnoreLab, Prime Sleep Recorder or Sleeptracker 24/7 let you know if you snore, how much, and what it sounds like, as well as give you the ability to download graphs and other data to analyze your nighttime snoring activity. How Does Airway Orthodontics Diagnose & Treat Sleep Apnea? Dr. Walker’s recommendation is to first schedule an expert diagnostic Airways Consultation at our Lunenburg or Harvard location. Your assessment includes a full health history and oral examination with our sleep apnea expert. You may also be asked to use a take-home sleep study kit for additional evaluation. Our holistic Airways Orthodontics approach also means using the cutting edge technology of our in-office iCat machine to capture quality 3D images of your nose, mouth, and throat tissues. This process can often identify any existing structural abnormalities or obstructions in your nasal passages. Treatment of mild to moderate obstructive sleep apnea can be very effective with conservative measures, by clearing the nasal obstruction and using a customized oral appliance to stabilize your lower jaw, tongue, and soft palate. Airway Orthodontics Is Here – Call Walker Orthodontics Today to Breathe Better, Feel Better, Live Better! The information provided in this article is not meant to be medical advice and is for educational purposes only. If you would like to learn more about this and other orthodontic-related topics, feel free to contact Walker Orthodontics, with convenient orthodontic offices in Harvard & Lunenburg, by calling 978.233.4206 or clicking here to request your complimentary, no-obligation Walker Orthodontics Smile Assessment.